Previous Cosmo Quiz: Who's Your Inner Female Pharaoh? Now, Hollywood movies may have multi-million dollar budgets—surely we should be happy with the high-quality portrayals we get (that 3-D version of The Three Musketeers excluded)—but we’re book-lovers. We’re a patient breed. We enjoy the little moments in between moments that make a good story flow. Leave the cutting and action sequences for Michael Bay. Needless to say, we’re always a little disappointed when our favorite part gets cut from a 90-minute screen portrayal of War and Peace. The solution? Miniseries! Miniseries, an astounding number of which seem to be based on books, take our favorite stories and fit them into more comfortable time slots. Instead of mercilessly slashing away at Great Expectations to shove it between TNT or FX-ready timeframes, we get 300 minutes of uninterrupted storytime. Don’t discount the miniseries, friends, because they aren’t counting the minutes and seconds. This BBC period drama aired stateside on PBS in September of 2012. Based on the memoirs of Jennifer Worth who worked as a district nurse and midwife in the East End of London during the 1950s, Call the Midwife, like its Downton predecessor, is a riveting portrayal of the everyday interactions and routines of a select wedge of English society. Jessica Raine enchants as the affable protagonist, Nurse Jenny Lee, but Call the Midwife’s true star is comedic great Miranda Hart as the clumsy but loveable Nurse Chummy Brown. Call the Midwife, like Downton, gets off to a slow start, but if you put in the effort, you’ll quickly tap into the absorbing urgency that rushes through the show’s veins. Based on a 2008 spy novel by Alan Furst, Spies of Warsaw follows the exploits of a French military attaché operating in Warsaw just before the outbreak of World War II. Set in an area undeniably pregnant with geopolitical tensions, Spies of Warsaw vacillates between moments of breakneck exhilaration and heart-stopping silence. It’s a definitive spy story, and Scottish favorite David Tennant is (predictably) magnificent as agent Jean François Mercier. North and South is a monolith of miniseries engineering. Adapted from the trilogy of the same name by American novelist John Jakes, the tripartite series broadcasted in 1985, 1986, and nearly a decade later in 1994. All three chapters recount the friendship of Orry Main, a South Carolinian soldier in the Confederate army played by Patrick Swayze, and George Hazard (great name), a Union soldier from Pennsylvania played by James Read. Both became fast friends during their time and West Point, but found themselves fighting on opposite sides of the battlefield once the South started seceding, or the North started aggressing, or however you like to characterize it. But North and South isn’t just special for the size of its story—the series is a treasure trove of late ‘80s and early ‘90s dramatic (and musical?) talent. David Carradine, Kirstie Alley, Robert Guillaume, Hal Holbrook, Jean Simmons, Elizabeth Taylor, Forest Whitaker, Erica Gimpel, Gene Kelley, and weirdly, Johnny Cash all make an appearance. Based on Alex Haley’s 1976 novel Roots: The Saga of an American Family, Roots is considered the greatest American miniseries of all time. In 1977, the year the finale aired, it set an all-time high precedent for Nielsen ratings, and still holds the record for the third-highest rated television program in American history. The series follows the (now iconic) Kunta Kinte (LeVar Burton), a man born in the Gambia in 1750, who is enslaved and brought to America, and his descendants as they navigate interracial relations and identity politics in antebellum and postbellum America. NBC’s The 10th Kingdom isn't so much based on a single book, but rather a folkloric compendium. New York City waitress Virginia Lewis (Kimberly Williams Paisley) stumbles upon a portal in Central Park that takes her and her bumbling father (John Larroquette) into an amalgamated fantasy world inhabited by characters from Brothers Grimm and Hans Christian Andersen fairy tales, as well as Celtic and Germanic mythology and even Mother Goose nursery rhymes. The result is a cheesy, albeit generally pleasant and distracting escape for those still in touch with their inner child. The cast is pretty great too. Besides Williams-Paisley and Larroquette, you have Dianne West, Ed O’Neill, Warwick Davis, Lucy Punch, and Camryn Mannheim. Starz’s 2010 miniseries The Pillars of the Earth is Downton Abbey… rewound about 800 years. Based on the 1989 historical novel by Ken Follett, The Pillars of the Earth explores the lives of the inhabitants of the fictional medieval city of Kingsbridge during the Anarchy, a civil war fought between the English and Norman factions of King Stephen’s reign. On top of war, the people of Kingsbridge must cope with other medieval nuisances: religious violence, plague, and general despair. That being said, the cast looks mighty fit for a bunch of disease-stricken, constantly-under-attack medieval Britons: Matthew Macfadyen, Eddie Redmayne, Hayley Atwell, Rufus Sewell, Alison Pill, and Sarah Parish, to name a few. Based on Evelyn Waugh’s 1945 novel of the same name, Brideshead Revisited is considered by many to be a veritable artifact of televisual history. Broadcast in 1981, it set a precedent from which all other modern miniseries take cues. The British Film Institute considers it one of the 100 Greatest British Television Programmes of all time. The series follows Charles Ryder, a man of little family money, and Sebastian Flyte, a typical British aristocrat, during their studies at Oxford. Ryder spends significant amount of time at Flyte’s family home, called Brideshead. It’s all recounted in the form of a flashback, as Ryder, an officer in the British Army, takes up residency in a country home he soon discovers to be Brideshead. The part of Charles Ryder is often considered the breakout role for British dramatic superstar Jeremy Irons—just another reason to be thankful for the advent of Brideshead. This 2008 HBO miniseries won four Golden Globe awards and an astonishing thirteen Emmys for its chronicling of the life of U.S. President John Adams (played by Paul Giamatti). Based on the book John Adams by David McCullough, the biopic-gone-serial is a seven-part retelling of Adams’ life, includes an unbelievable soundtrack composed by Rob Lane and Joseph Vitarelli, and boasts and outstanding cast of dramatic greats portraying some of our most famous historical figures. Laura Linney as Abigail Adams, David Morse as George Washington, Rufus Sewell as Alexander Hamilton, Justin Theroux as John Hancock, Danny Huston as Samuel Adams, Mamie Gummer as Sally Smith Adams, Tom Hollander as King George III, and Tom Wilkinson as Ben Franklin. The 2001 HBO miniseries is the story of the Easy Company of the U.S. Army 101 Airborne Division. It follows their movements and missions in World War II Europe from D-Day through V-J Day. Executive produced by Tome Hanks, Steven Spielberg, Gene Kelly, and author of the book Stephen Ambrose, Band of Brothers is highproduction value meets excellent writing in this stellar portray of soldier life in wartime Europe. A pre-Homeland Damian Lewis leads a stellar cast along with Scott Grimes, Ron Livingston, Donnie Wahlberg, and others. Band of Brothers is a great way for millennials to experience one of the most impactful periods of American (and world) history in a well researched, unpretentious, but vivid and believable setting. 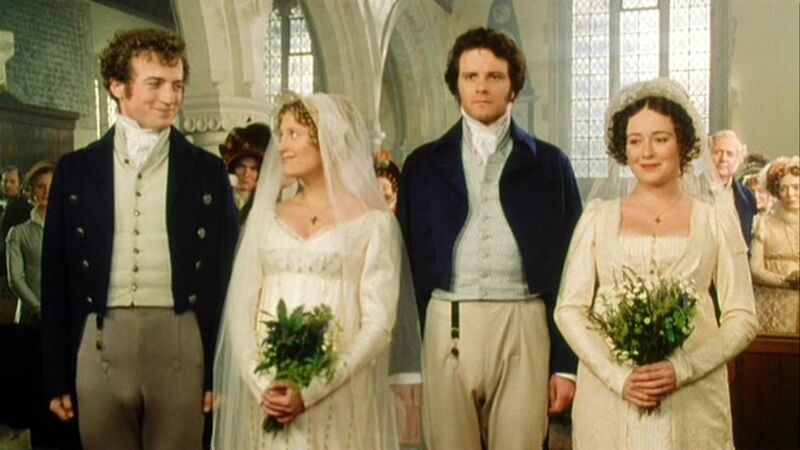 The 1995 adaptation of Jane Austen’s Pride and Prejudice was the miniseries that took Colin Firth from handsome, bumbling, lovable Englishman into the object of nearly every woman’s desire on both sides of the Atlantic Ocean. While Joe Wright’s 2005 adaptation à la Keira Knightley was certainly well-done, its chief criticism seemed to be “WHERE IS COLIN FIRTH?? ?” But in all seriousness, this BBC rendition of the Austen classic is a far better representation of the author’s work. While Wright managed to shrink down the story into a bite-sized 127 minutes, the miniseries runs at 300 minutes long—plenty of time to fit in all of the social subtleties and casually dropped handkerchiefs of a true Austen story. "FYI, UK TV: Up The Women"
"Crack TV: The Dangers of Our Marathon TV Watching Habits"